It’s one of those times of year again. You know, the ones that periodically leak into our consciousness? A weird lull has taken hold of the Toronto sports scene. Baseball season is still more than six weeks away, the Leafs are in the toilet and the Raptors have levelled off, both in terms of their success and overall expectations. Trade deadlines are approaching but only gradually. There’s still a ton of games left in both the NBA and the NHL (too many, honestly) and the MLB off-season has ground to a halt. Basically, there’s stuff happening but nothing is happening man! Except… it’s all happening, you know what I mean? No? Well let’s get down to it and see if we can’t figure out just what the collective vibe is right now in the Big Smoke. 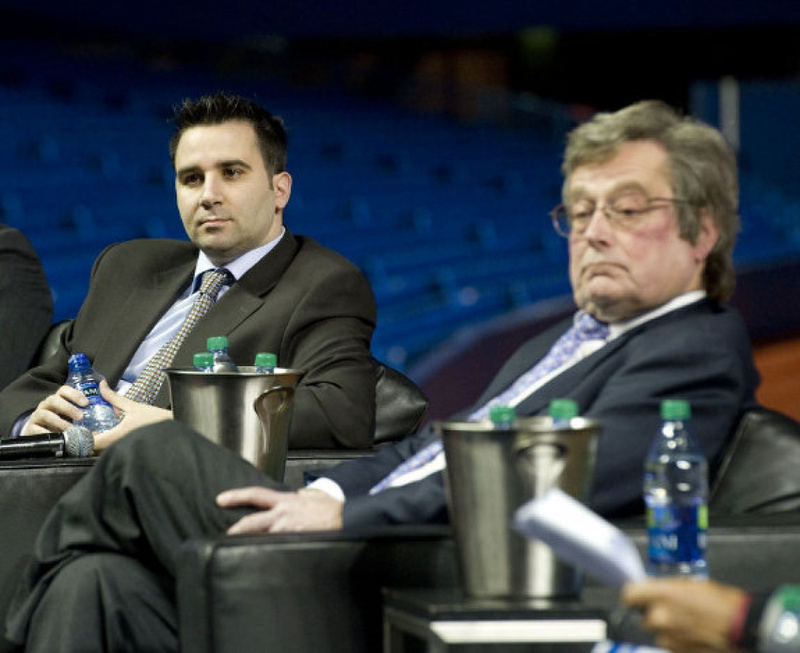 How comfortably are Paul Beeston and Alex Anthopoulos sitting these days? After the early acquisitions of Josh Donaldson and Russell Martin created a positive buzz among the fans, the Blue Jays off-season has been dominated by weird front office politics. At first President Paul Beeston was retiring, then he was being ‘forced out’. The Jays had interest in the Orioles Dan Duquette as a replacement, which led to a war of media leaks and ridiculous compensation rumours between the two teams. Now Beeston is back for the 2015 season, supposedly his last with the team. General Manager Alex Anthopoulos, never one to talk out of turn, was notable for his silence during the entire process. Sure, he did an interview here or there, but he never addressed the Duquette situation publicly – I mean what was he going to say? All that said, the Jays have also been conspicuous via their lack of roster moves since the whole Beeston-Duquette situation began. It’s possible the two are unrelated, but regardless of the reason, this Jays roster feels unfinished. Second base is currently set to be filled by Maicer Izturis/Ryan Goins/Devon Travis, and a lot is being laid on the shoulders of youth – Dalton Pompey, Aaron Sanchez and Daniel Norris are all being counted on to make sizeable contributions during 2015. despite having a miniscule amount of collective experience. A boring team state of the union this past Thursday addressed everything from real grass in 2018 to payroll expectations in 2015 (expected to rise! But no indication of for what, or by how much, or whether or not there even IS in fact, a spoon). Now it’s a mistake to try and build your team 100% before the season starts. Players emerge, players disappear and injuries happen. It’s rare a projected starting line-up is intact at seasons end, particularly in baseball, so it’s certainly possible the Jays, always fond of trades, could make moves during the season. And you have to love the potential of a Reyes-Martin-Bautista-Encarnacion-Donaldson top 5 in the batting order. It just feels like many of the questions that plagued the Jays last season are still unanswered. There’s a certain ‘I-don’t-know-what’ about this team right now. Top heavy. That’s how the Jays look right now. Top heavy. Let’s hope they don’t bowl over. If Alex Anthopoulos wasn’t particularly chatty over the past couple months, the Maple Leafs Brendan Shanahan set a new record for radio silence. I’m not even sure how you’d measure that. It’d be like trying to see how much peanut butter is NOT in the jar, you know? And Shanahan has been seriously low on Skippy! Don’t worry, that wasn’t supposed to make sense. If you follow the team, you’ve heard the numbers. 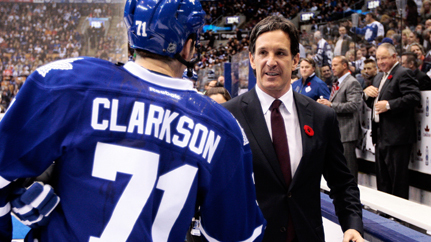 January 2015 was the worst month in the history of the Toronto Maple Leafs. They went 1-10-1, and scored an unfathomable 1.22 goals per game, which is wild considering that prior to that they were 2nd in the NHL in team scoring. I was personally a big proponent of keeping former coach Randy Carlyle in place until seasons end and some would say the Leafs effort since his departure would support that stance. But as the season wears on, it’s become clear that the Leafs core is flawed regardless of playing style. When they were scoring they couldn’t stop anyone and now that they’re playing a more responsible defensive game, the offense has completely dried up. That speaks to a lack of two-dimensional players on the roster. I mean, can you name even one Leafs forward you would call an elite two-way player? There are third liners with a bit of scoring pop and top six guys who do enough not to embarrass themselves on the back end, but nobody who truly excels at both ends of the ice. The Leafs are likely to clean house both at the trade deadline and in the summer. However, it’s going to be tough to move the teams most onerous contracts while getting anything of value in return – David Clarkson, Dion Phaneuf and even Phil Kessel have a punishing amount of dollars and term left on their deals. As for Shanahan, I mean, what can he really say? He was sold as a winner when he was introduced by Tim Leiweke. The Leafs haven’t done much winning since. Less than a year ago, the pair of them used my “favourite” catch-all phrase and talked about ‘changing the culture’ of the Leafs franchise. You see him in the rafters at Leaf games getting hot under the collar, just like when he was a premier power forward in the league, a three-time Cup winner. He’s a competitive guy and he grew up in Toronto. He’s well aware of the enormity of the task in front of him. It feels to me like Shanahan has spent this year seeing what he has, which as of now, isn’t a whole hell of a lot. I’m going to reserve judgement until after Shanahan hires his first head coach and gets the chance to put his own fingerprints on the roster. I don’t mind the lack of sound, as long as it’s followed by an abundance of fury. 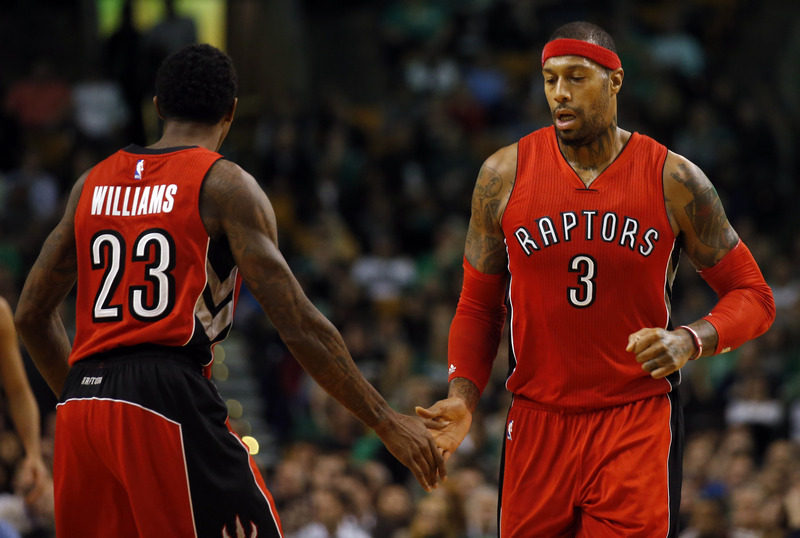 But the Raptors do have (the Legend of) James Johnson. I want to end on a positive note, as the Raps just had a great weekend, banking home wins over the Clippers and Spurs. That said, the Raptors are just 11-9 in 2015 and some glaring flaws are becoming obvious when Toronto plays against stiffer competition. One severe limitation that has become apparent is that the Raptors perimeter personnel are sub-par as a whole on the defensive end. Kyle Lowry is tough but undersized, DeMar DeRozan is an improved team defender but struggles on the ball at times and the Lou Williams/Greivis Vasquez combo can create steals but are huge liabilities otherwise. At the forward spot, Terrence Ross has the talent but is inconsistent. Only James Johnson brings the intensity and physicality necessary to play elite perimeter defense on a consistent basis – unfortunately, he hasn’t shot well enough from distance to justify consistent starters minutes in a lineup that includes Amir Johnson and Jonas Valanciunas. The team as currently constructed is going to have to lean entirely too heavily on the two Johnson’s to anchor their defense against elite teams. James’ minutes fell off after Terrence Ross was moved to the bench and then he suffered a minor injury that cost him four games. The Raptors have gone 9-3 since the Ross move, even without JJ, as it coincided nicely with a soft spot in their schedule, but Johnson plays in two of their most effective five man lineups. He earned a start last night against the Spurs and had a fantastic game, scoring 20 points and finishing a +19 in 30 minutes on the floor, leading the team in plus/minus per minute. This leads to the most pressing question; are the Raptors going to make a major roster move before the playoffs? Their ceiling appears to be limited if they don’t. They have nearly 18 million dollars in expiring contracts and multiple first round picks over the next several seasons, assets that would be attractive to potential trade partners. Speculation has been that power forward is the spot where they would most like to upgrade – if they could do so while keeping Amir Johnson on the roster, even better. However, I think a small forward addition would be even savvier. It would allow them to move JJ to the power forward spot more often and keep Ross in the bench role where has been performing well. What remains to be seen is exactly who will become available, but a player like Wilson Chandler from Denver or Thaddeus Young from the Timberwolves could fill the niche nicely. If Toronto stands pat, it’s likely the flaws we’ve seen are going to be what eventually sinks them against the elite of the East. So after all that, how would I classify the vibe in Toronto right now? Well, unfortunately it mirrors the Blue Jays. We’re more top heavy than Dolly Parton in an iron lung right now! The Raptors are a lot of fun but the disastrous Leafs and the fluid Blue Jays are dragging the overall feeling down. Here’s hoping that We the North runs deep into May and the Jays sort themselves out before spring training; otherwise, Toronto fans will again be left scratching their heads and, perhaps appropriately in this Valentines week, holding their hearts. ← Cultural Plunder: Are Indiana Jones and the Ghostbusters Off-Limits?